Just as with viruses, bacteria are a problem for plants and animals, although, in plants bacterial diseases are less common than fungal or viral diseases. Unlike viruses many bacteria are free living; they can be parasites like viruses, saprophytes or autotrophs, like plants. Bacterial cells are small (5 or 10 micrometers) rods or spheres (cocci), just visible under the light microscope. In their active state they have a thin peptidoglycan cell wall and a lipid membrane enclosing all of their genetic material, enzymes and metabolic intermediates. Most bacteria can form a resting spore with thick polysaccharide coat. In this form they can survive extreme heat, cold and dessication for long periods. When we looked at viruses we considered one of the essential aspects of life - replication, transcription and translation of genetic material. We were not sure whether to say they were alive. The other essential feature of life is a membrane, at least around the outside of a cell. Although they are so simple bacteria can carry out all of the metabolic processes of more complex organisms, respiration, photosynthesis and the synthesis of all of the biological macromolecules. Although we may bracket them together as "microbes", there is a huge step in complexity between a virus and a bacterium (which by the way is the singular of the plural term "bacteria"). Bacteria are incredibly versatile and they can tolerate environmental extremes that kill most other froms of life: high and low temperatures, absence of oxygen, presence of all kind of toxic chemicals. They have colonized just about every habitat on earth and in numbers or biomass they must be the most successful organisms. Bacterial diseases of plants tend to cause spotting of leaves, stems or fruits; sometimes bacteria cause soft rots in which tissue becomes a slimy mess. Generally speaking bacteria cannot invade healthy plant tissue; they need a wound or an area of dead or dying tissue to start an infection. Plant bacterial diseases can be controlled with the same kinds of antibiotics that are used to control animal diseases, such as streptomycin. However, we are generally reluctant to use these on a large scale and control is usually based on avoidance or removal of sources of innoculum. Nitrogen is essential for all life on this planet, but most of it is in the air, making up about 78% of the earth's atmosphere. Bacteria are the only organisms capable of taking gaseous nitrogen and combining it with hydrogen to make ammonia. So nitrogen-fixing bacteria are an essential part of all ecosystems. Mostly they are free-living soil organisms, but some plants have developed an association with bacteria which infect their roots and , in return for sugars from the plant, fix nitrogen which can be used by the plant for growth. The most important belong to the genus Rhizobium, which infects the roots of both trees and herbaceous plants in the bean family (Fabaceae or Leguminosae). 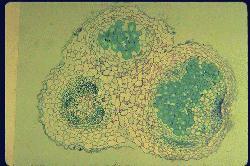 The bacteria live in nodules on the plant root. The reduction of nitrogen to ammonia can only occur in the absence of oxygen. The sheath of plant cells around the bacteroids keeps oxygen out. Along with the fungi, bacteria are the most important decomposers in all ecosystems. Without the recycling activities of these organisms life would grind to a standstill because all nutrients would get locked up in dead plants and animals. When we build a compost heap we are using bacteria and fungi to solve our waste-management problems, and at the same time we make ourselves less dependent on inputs of nutrients from the farm or garden store. Bacteria were the first organisms to develop the capability to use solar energy to make organic compounds. 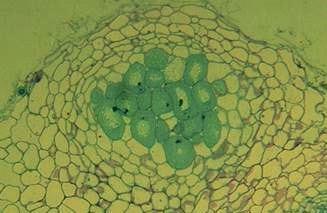 We now think that more complex organisms, including plants acquired this capability by the capture of bacterial cells which became their chloroplasts. The most important group of photosynthetic bacteria are the blue-green algae that are an important component of the phytoplankton in seas and lakes. There are several differences in the details of photosynthesis in bacteria and plants. Some bacteria can use molecules other than water as a starting material.